“Live Free or Die” in New Hampshire this fall while taking in the breathtaking scenes. With over 90 state park properties, you will never run out of recreational activities to partake in. Properties include beaches, trials, historic sites, campgrounds and more. You’re sure to find a state park that strikes your fancy and accommodates your favorite fall activities. If you’re an apple eater, you’re in luck! Southern New Hampshire has several must-visit apple orchards where you can pick your own apples while taking in the cool fall air and scenic backdrops. Weather you like Golden Delicious, Granny Smith or McIntosh Red, take a bite out of fall with apple picking in New Hampshire. If you have ever wanted to visit Maine, autumn is the time to do so. There is fresh lobster available year-round, the weather can’t be beat and there are dozens of fairs and festivals to take part in. Have we peaked your interest yet? 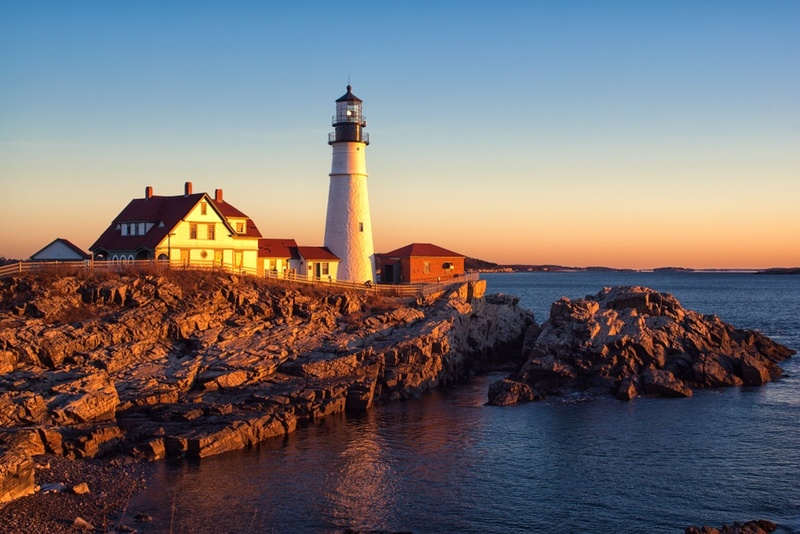 Another reason to visit Maine is to enjoy over 60 lighthouses that sit along breathtaking views of the coast. One of the most iconic lighthouses is Portland Head Lighthouse in Cape Elizabeth. Portland Head Lighthouse is the oldest lighthouse in Maine and the most photographed lighthouse in the country. Adjacent to the lighthouse is Fort Williams Park which boasts 90 acres of recreational space. Spend your off-day at the park flying kites, picnicking on a sunny day or taking a selfie in front of the lighthouse. Whoever said “don’t go chasing waterfalls” was wrong, because Pennsylvania is riddled with these must-see plunging beauties. After a long week of work, take a stroll (or hike) to one of the dozens of state parks across the state and visit a waterfall or two. We recommend Nay Aug Falls, Fall Brook Trail Waterfalls and Raymondskill Falls. The combination of soothing running water and beautiful fall backdrops will bring you to a peaceful state of mind. 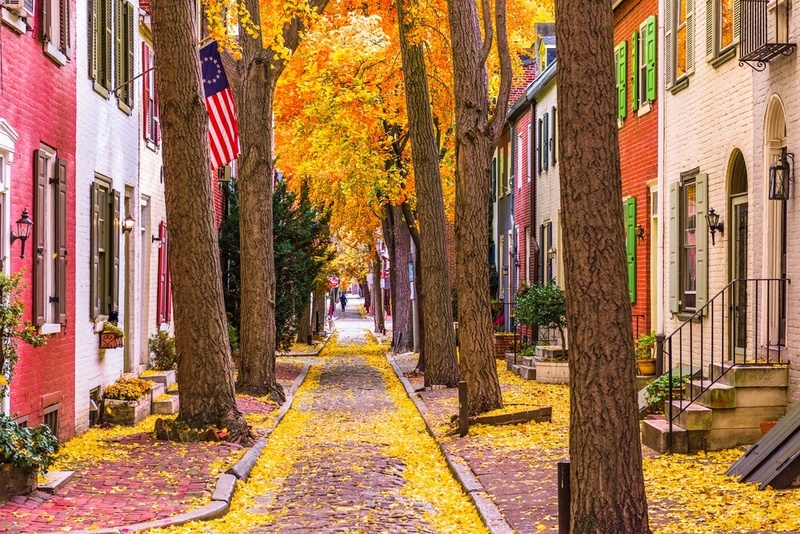 If you’re more of a city person, make sure to take a trip to Philadelphia to take in one of the dozen fall festivals and special events in the “city of brotherly love.” The Midtown Village Fall Festival, the haunted house at Eastern State Penitentiary and 6ABC/Dunkin Donuts Thanksgiving Day Parade are all must-see events. If you’re into sports, be sure to participate in (or just watch) the Philadelphia Marathon, catch an Eagles football game or take in one of the greatest rivalries in sports—The Army-Navy game. Vermont is a sweet place for travel—and we’re not just saying that because it’s the maple syrup capital of the country. The thousands of acres of mountain terrain turn yellow, orange and red in the autumn and are filled with skiing slopes and hiking trails. There is no shortage of lodges and resorts available for weekend trips to get the full Vermont fall experience. And, if you have never seen or been in a covered bridge, we recommend visiting one of the 100 covered bridges in VT.
Take a day trip to visit one of the numerous vineyards in Vermont. Most vineyards have stunning views of the fall foliage, which is the perfect backdrop for tasting local wines. The Boyden Valley Winery, Lincoln Peak Vineyard and Shelburne Vineyard are some of our favorites.